Don’t make forecasts about the 2104 harvest just yet! I gave him a blank look, so he explained about the latest destructive visitor to our vineyards, and I tucked it away as something to ask Ticino winemakers about later, since it was starting to cause damage there, he said, “but not yet in our vineyards”. That was then. Today “panic” is a word being touted in wine circles in Valais, given the insect’s ability to spread rapidly and quickly destroy a ready-to-harvest vineyard. A mild winter followed by a cool rainy summer appears to have greatly encouraged the northward spread of the little pest. Growers in most areas have talked about the beautifully healthy grapes, hinting at what could be a good harvest – but Suzukii, which favours ripening to ripe grapes, must have been listening. Swiss vineyards began harvesting in some areas a little over a week ago, notably in canton Valais, with Vaud gearing up. And suddenly I’m seeing Suzukii everywhere on winery Facebook pages – a producer in Sion this morning said he hasn’t slept for six nights, losing sleep over it. Swiss wineries are pioneers in organic, sustainable approaches to growing grapes, but I can understand why some producers find it hard to be enthusiastic about taking on a potentially deadly foe, even if it gives them an opportunity to shine. The Valais cantonal agriculture service last week counseled grape growers to get air moving through the vines to keep them as dry as possible and to start picking as early as possible once maturity is reached – which translates into several passes through the vines, picking more frequently as the grapes ripen. It’s an additional burden that comes during one of the busiest times of year. More surprisingly, since spraying is not generally done close to harvest time, we’re seeing growers spraying organic treatments, one of which is powdered clay, used in an attempt to disguise the grape’s colour. Suzukii goes only for red grapes. 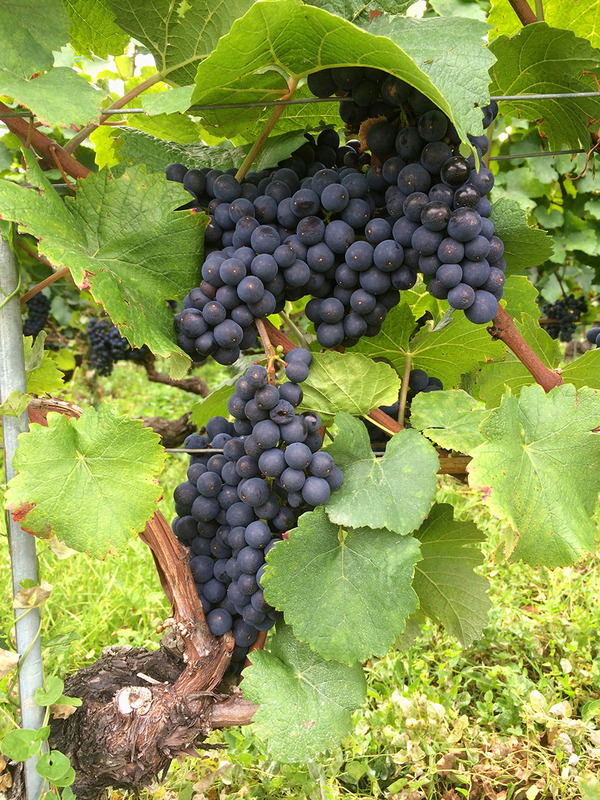 Xavier Bagnoud, an oenologist in Leytron, told Valais newspaper Le Nouvelliste that he fears Suzukii could be as dangerous for the long-term survival of vines as phylloxera was for Swiss vineyards at the start of the 20th century. Daniel Dufaux of Badoux winery and president of the Swiss Oenologists Association, is taking a more sanguine approach, noting on his Facebook page today that it can be viewed as an opportunity for Swiss wineries to display their know-how. Suzukii’s formal name is Spotted wing drosophila (SWD), Drosophila suzukii. In California it’s sometimes called the spotted wing drosophila and cherry vinegar fly. It “is an insect pest of economically valuable small fruit and tree fruit crops”, according to Oregon State Wine Research Institute, which has been following it’s path through the US state’s fruit orchards and vineyards since 2009. SWD is Asian in origin. 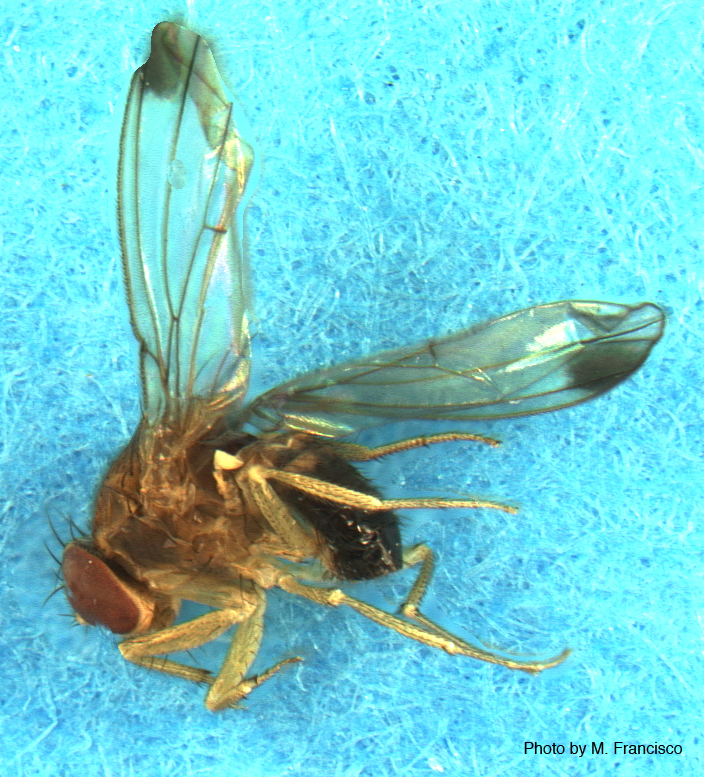 Swiss and other fruit-growing areas have long had the common drosophila, a winged cousin that attacks over-ripe and rotting fruit. SWD, however, is able to go for the fruit at an earlier stage, when it is ready to harvest, thus having huge potential to cause serious economic damage. It spread to North America in 2008, Europe (Spain, Italy) in 2009, then moved into France in 2010. Its arrival in Switzerland dates back to last year. It likes cherries, strawberries, raspberries, blackberries and blueberries, in addition to grapes. It makes a hole in the skin of ripe fruit, leaving an opening that attracts bees and wasps, causing the fruit to rot more quickly. One week ago the web site for organic growers in Switzerland was cautioning that SWD was also being seen in ripening elderberries – noting that it happily moves back and forth between cultivated and wild plants. If you’re a home fruit grower, you might want to check out Bio actualité’s preventive measures and a recipe for traps for the insect.